The above video is an example of what a traditional tile removal job in Arizona looks like. Regardless of what you have heard or been told, traditional tile removal is time-consuming and messier than you think. If you like your home squeaky clean, you might not be pleased with the mess created. The last thing you want is to worry about removing of floor tiles that leave behind dust and debris, contaminating the air inside your home and posing a health hazard. However, these concerns are a thing of the past with dust free tile removal services. The method is clean, efficient and cost-effective. If you are still not convinced, read on to assess and evaluate the benefits of dust free tile removal in comparison to traditional tile removal. The process is actually dust-free, as its name show. This means you don’t have to worry about layers of dust getting on everything around your home when you opt for dust-free removal. Your home will look just as great without you having to spend more time and money cleaning and fixing electronics and other household items which may be affected or damaged during the traditional removal process. The equipment used by our DustRam service providers eliminates dust particles with its powerful vacuum cleaner, thus preventing them from spreading around the home. Traditional removal, as mentioned earlier, leads to a mess, and it could take at least a couple of hours (and a lot of effort) to clean it up. You might end up spending more money if you pay a professional cleaner to do the job for you. Hence, traditional flooring removal proves counterproductive. In addition, if the removal takes a considerable amount of time due to extensive renovation, you might have to find alternate accommodation. This will further increase costs, as you will most probably stay at a hotel. This is not the case if you opt for dust free tile removal. In most cases, it will take no more than a day for the work to be completed while you do not have to worry about dust flying around. But most importantly, you don’t have to spend more money just to have your home cleaned. The risk of medical conditions, like silicosis, increases because of silica-based particles in the air inside your home after tile removal. Not only can they cause health problems, it can worsen existing conditions, like asthma and, allergies. Rest assured, you will not have to worry about this with dust free tile removal as any and all risks and dangers are completely eliminated for both, the inhabitants of the home and the workers as well. Even though traditional methods seem inexpensive, it is ineffective as well. It can take several days before the job is done, which in turn can create more problems for you. But with dust free removal, things can be done a lot quicker. It has been noted that using the dust free tile removal method, technicians can remove up to 600 square feet of tiles in a single day. Using the traditional method, they can hope to cover half as much area as this, at best. No dust removal is precise and accurate. 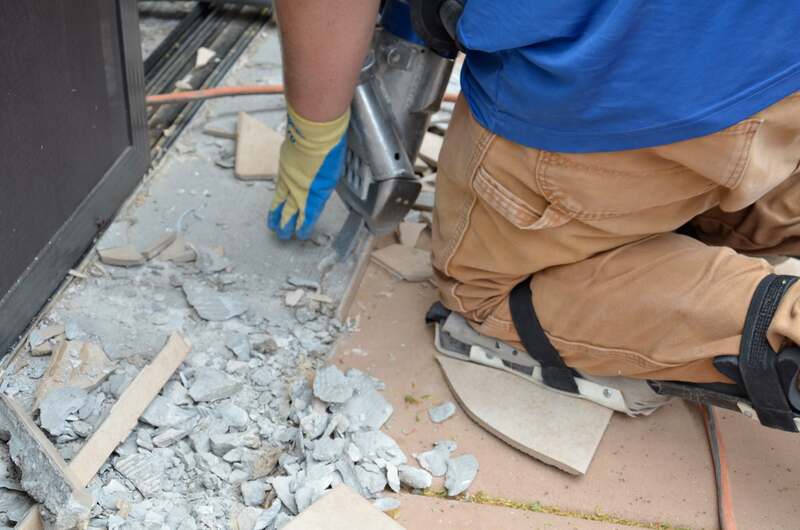 During the conventional tile removal process, the risk of chipping is prevalent and the slabs can get damaged, which leads to more work. This means you will have to pay your contractor to remove the tiles and invest more time preparing and repairing the area before the new tiles are installed. Dust free tile floor removal, in turn, prevents the need for extensive repair work and will keep slabs flatter, thus making installation easier as well. As you can see, there are various additional costs you have to incur when opting for traditional removal and this doesn’t account for any hidden costs. 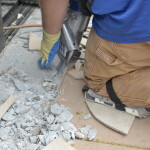 Considering the fact these low budget tile removal service providers depend on chipping tools and hammers, they end up doing more harm than good. Not only will your floor look horrible, but it will be uneven and the distortion will be noticeable. To correct these problems, you might end up spending more money than you already have. With dust free, the only cost you bear is the compensation for the tile removal services you used. Not only is the method quick and efficient, but also clean, which means you don’t have to deal with a mess once the work is completed. In fact, once the job is done, your home will look clean, if not cleaner, than the condition it was in before. As the work is done quickly, you don’t have to wait for days upon days for the job to be completed. This also eliminates the need to look for alternate accommodation during the time the work is being performed. Experienced dust free services get the job done right at the first attempt, so there are no additional costs and also you don’t have to bear unnecessary hassle. 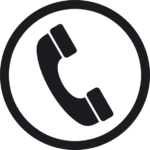 Enough emphasis cannot be placed on the fact that you still need to do some homework and find a service provider that has the experience needed to get the job done in no time. This means you may have to search online, go through reviews and even ask friends and family for referrals. The last thing you will need is to spend money and not get the results you had initially hoped for. Now that you know about dust free tile removal and its benefits, there is no reason why you should not make the most of it. All in all, it is safer, cheaper and offers true value for your money unlike its ineffective counterpart. Oh, and it’s dust free!